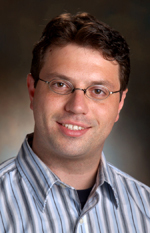 Marinko V. Sarunic is an Associate Professor, School of Engineering Science, Simon Fraser University, Vancouver, Canada. Dr. Marinko Sarunic is an SFU alumnus, having received a B.A.Sc. in Engineering Physics from Simon Fraser University in 1998. He continued on at SFU for a M.A.Sc. thesis, under the supervision of Dr. Glenn Chapman. In 2006, he completed a PhD at Duke University with a research focus on Fourier domain optical coherence tomography.